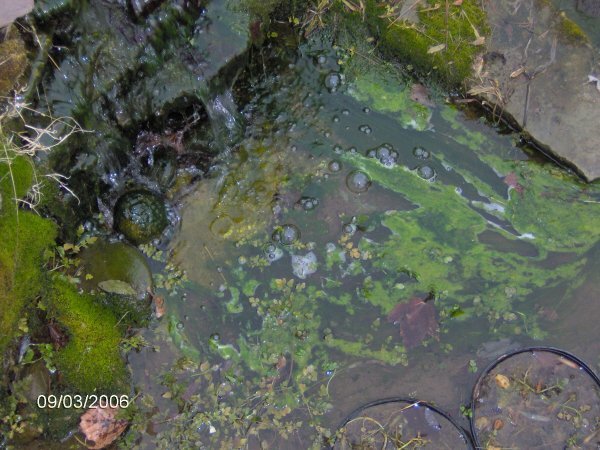 Hair algae in my little stream in my 1800 gallon pond on 3/9/06. Here is another photo of hair algae in the waterfall outflow mini pond sort of area taken at the same time. Pond algae information is now found on many different pages. Other Methods of Reducing Algae - by hand, algicides, dyes, coagulants, alum, Meridian mats, etc. For information on dealing with algae in aquariums (removing algae, algae-eating fish, chemicals, cloudy and green water, etc. ), go to my aquarium algae page. I also have an algae-eating animals comparison table that is helpful. 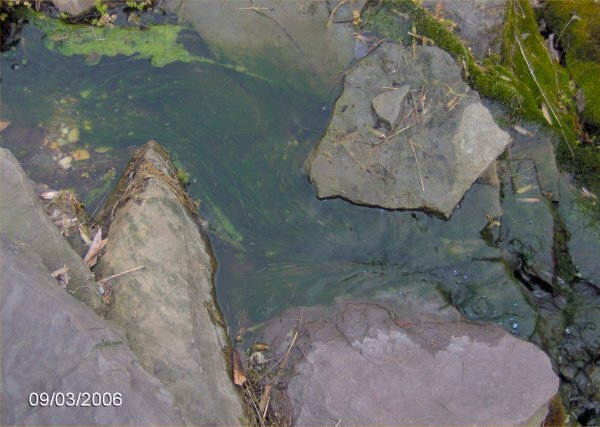 On the pond talk page there is a lengthy discussion about the benefits of algae and other algae-related topics. There is an article I wrote for a newsletter entitled "How to Have a Crystal Clear Pond Year Round" on my articles page. Note that there is a lot of information on algae on other pages as it relates to those topics.